Nah, I don't buy it. There's something very fishy about this report. Internet trolls responsible for the investigation of three British police officers? I don't think so! Usually when the word 'trolls' enters the narrative, it originates from a source close to the family. The exact same report is featured in the Sun. Clearly it comes from a central source, not a journalistic exclusive. Now who could that be ? And Scotland Yard found there was no case to answer. Of course they would if they were investigating themselves. Where does the media get these stories from? And where is Olive? She's probably in no.5 sharing a few strawberry vodkas with her bestie as they plan the next load of nonsense. Or frantically preparing to leap out of yer cornflakes .... BOO!!! I think there is something about this which is important - but what! What is it the police officers were doing? Apart from failing to interview any of the Tapas group. 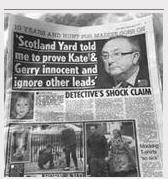 It would not surprise me, if it was the Mccann's and their legal team who raised a complaint against the police. 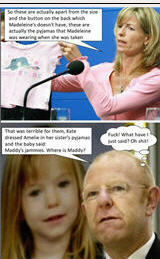 This might be a warning to the Mccann's to leave the police alone. I think it is much about nothing. No mention of FOI admission or response. No detail about anything at all. I can find nothing on the Met's FoI disclosure site, nor on the IOPC site. @Doug D wrote: I can find nothing on the Met's FoI disclosure site, nor on the IOPC site. 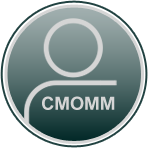 Hi DougD,,perhaps its a fishing expedition they want to send a Senior member of CMMoM to send FOI's to Operation Grange,One who has special advice on what he cannot report on,careful! which appeared in the Scottish edition as well. "Details of the cases were disclosed under Freedom of Information laws." I wonder if you would be kind enough to let me have a reference number, so I can follow this important story. I will look forward to the reply to that, if you get one. 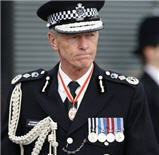 Operation Grange is now back on the Met Police website. Perhaps it was the vital last Three Police Officers who were still working on Operation Grange investigating the Last Throw of The Dice scenario? Nothing constructive has come out of Operation Grange yet? 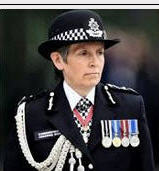 The only information has come out of long winded statements by very Senior Officers,who then quickly sought retirement in the House of Frauds£300.00+expenses per day or promotion in the Metropolitan Police service! They couldn't be arsed like DCI 1485,Messiah,April 2008,to question under caution any Tapas7/9,that might have been pertinent or relative to a missing child named Madeleine McCann-Super Injunction! Just another Cover up in the history of a now long list on a top shelf,stating Do Not Open until 100 years have passed! Perhaps they were investigated for playing dice . . . instead of doing whatever it is they are supposed to be doing. Incidentally, if the Sun article, which has now been repeated in Police on-line fora, proves to be untrue, it is seriously defamatory of the officers concerned. It suggests three were investigated, and since there are only four left, they may have a case. @PeterMac wrote: Perhaps they were investigated for playing dice . . . instead of doing whatever it is they are supposed to be doing. 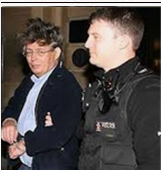 They may well have a case but with Rebekah Brooks (who demanded that Operation Grange be set up) knowing far too much about the Met Police, would they dare to upset her? At the very least she was once accused of paying them for information. Would these officers be free to sue The Sun, or would fear losing their jobs, promotion etc.? Of course the "Grange 3" might include DCI WALL herself ! Their rank is not specified.